(Reuters) - Gold held steady but pared some gains made early on Thursday as the dollar recovered and minutes from the U.S. Federal Reserve's recent meeting showed an interest rate hike was imminent in December. Spot gold (XAU=) rose 0.2 percent to $1,223.75 per ounce at 15:12 p.m. EST (2012 GMT), having earlier hit its highest since Nov. 22 at $1,228.96. 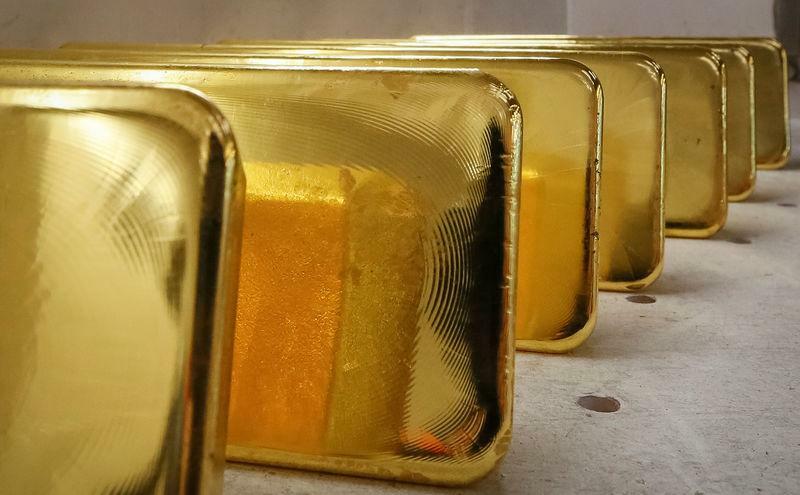 U.S. gold futures (GCv1) settled up barely changed at $1,224.10. Minutes from the Fed's Nov. 7-8 meeting showed that almost all Fed officials at their last meeting agreed another interest rate increase was "likely to be warranted fairly soon," but also opened debate on when to pause further hikes and how to relay those plans to the public. "The rate hike is still ahead of us and that is a temporary headwind for gold," said George Gero, managing director at RBC Wealth Management. "The stock market firming is supporting the dollar, which is not good for gold." Gold jumped on Wednesday after Powell said the central bank's policy rate is "just below" estimates of a level that neither brakes nor boosts a healthy U.S. economy. "Geopolitical risk between Russia and Ukraine is going to cause investors to move into the gold market as well. We could see another conflict arise, a much more aggressive one than what we saw previously with Crimea," said Phil Streible, senior commodities strategist at RJO Futures in Chicago. Spot silver (XAG=) was steady at $14.31 an ounce. Platinum (XPT=) dipped 0.2 percent to $819, having slipped to a seven-week intraday low of $809.50 on Wednesday.